Под требования R.24/31 компания "Short Brothers" разработала и построила новую летающую лодку. Это был моноплан с крылом типа "чайка", получивший обозначение S.18 и неофициальное название Knuckleduster. Самолет оснащался двумя двигателями Goshawk, низкая надежность которых привела в итоге к тому, что самолет так и остался опытным экземпляром. 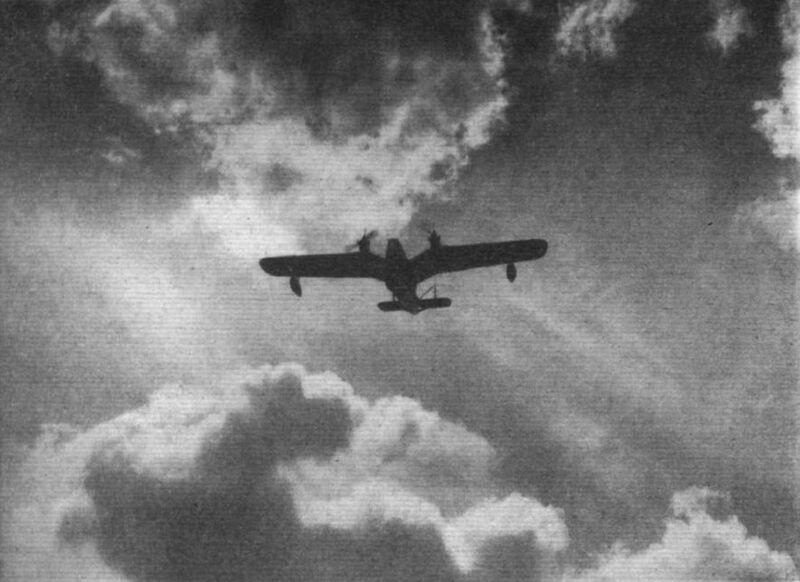 OFFICIALLY known as the Short R24/31, the Short "Knuckleduster" monoplane flying-boat has already been illustrated in Flight (February 8, 1934), but so far a detailed description has not been released. 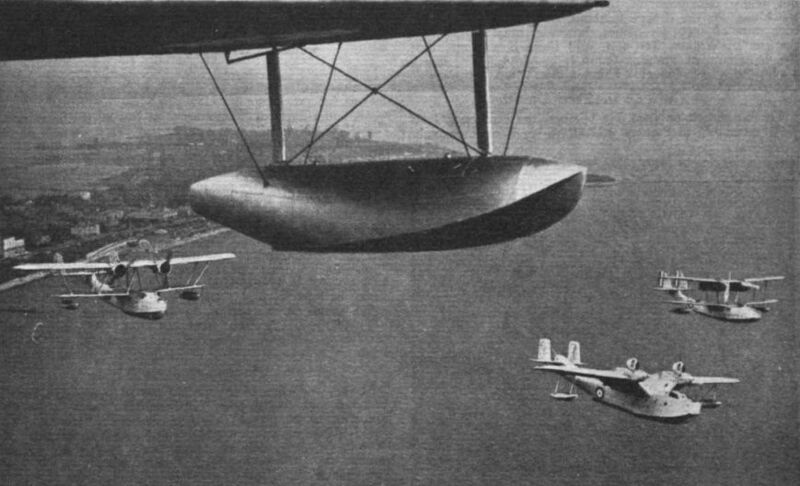 This boat is, with the exception of the small "Cockle," the first monoplane flying-boat to be built by Short Brothers at Rochester, and this fact alone makes it of particular interest. It was primarily constructed because the firm felt that very little monoplane flying-boat experience was available in this country. A boat of this nature would, we imagine, form a stepping-stone between previous boats and a really large boat with high wing loading which would necessitate the fitting of developments such as wing flaps and controllable-pitch airscrews. From all reports the R24/31 has fully lived up to its manufacturers' hopes, and has provided them with a considerable amount of valuable data. The first thing that strikes an observer is the gull-type wing. This was used in order that the necessary water clearance could be obtained for the airscrews and to provide a rigid attachment of the wing to the hull. As the machine is a type for military purposes, and built to an Air Ministry specification, its performance and characteristics cannot, of course, easily be compared with those of civil boats, but it would seem probable that many of the lessons learnt are capable of being incorporated in future civil types. The construction of the main plane is entirely of metal, with spar built up in the form of a braced rectangular tubular structure. The booms of this spar consist of four high-tensile steel tubes, of which the diameter and gauge are reduced towards the wing tip. The ribs are of duralumin tubing with duralumin corner plates. The wing is fabric-covered in the main, but the leading and trailing edges are metal-covered for a portion of the chord. The ailerons, which have sheet-metal ribs, are of the Frise type. A braced monoplane tail supports twin rudders and fins; the spars of the tail plane are of the braced girder type; the front spar is continuous, while the rear spar terminates at the centre in a structure which houses the rear tail gun. The rudder, elevators, and fins are of metal construction similar to that of the tail plane. Two Rolls-Royce "Goshawk" engines are mounted on the wings at the knuckles and raised slightly in order to provide adequate water clearance. The mountings are of welded steel tubing faired with detachable duralumin panels. These engines are evaporatively cooled and have condensers mounted on top of the nacelles behind them. The fuel is carried in two main welded aluminium tanks of 178 gallons capacity each, and two tinned steel 46-gallon gravity tanks. The systems are balanced across the hull so that either engine can be fed from any tank. The hull of the R24/31 has accommodation for a crew of five - first and second pilot, front gunner (who is also a bomb aimer), wireless operator and engineer. In the bow is a gun cockpit with the bomb aimer's hatch and seat. In the pilot's cockpit the pilot s seat is on the port side, with a removable set of flying controls on the starboard side. 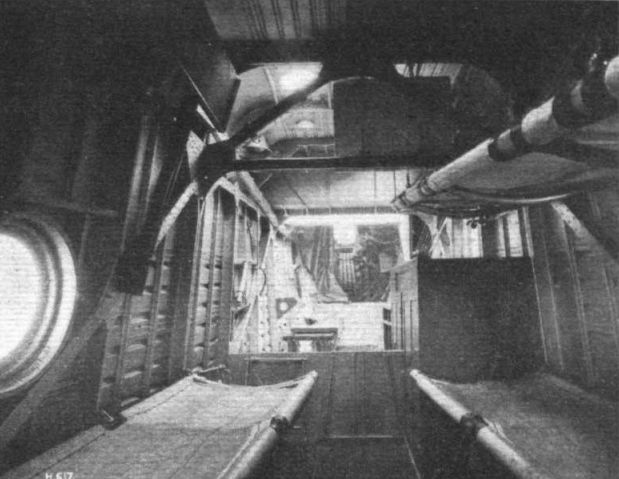 Behind this is the navigator's compartment with a chart table and compass ports for taking bearings, and two officer's bunks. Then there is the wireless and engineer's compartment, which comes between the spar frames, the wireless operator being seated on the port side and the engineer on the starboard side. The crew's quarters include two fixed bunks and one folding bunk, and then abaft them are washing and cooking facilities. 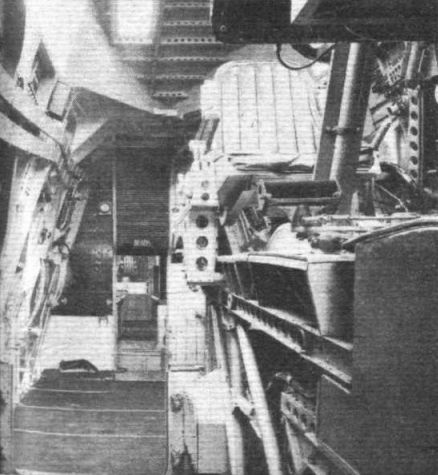 Further aft still is the mid-gun cockpit with a bench for the engineer, a lavatory and stowages for drogues, then, finally, there is the tail gun cockpit. Straight-sided frames are used, and the whole structure is completely braced from near the bow to the rear step. This braced structure is stressed to carry all main loads, the corrugated skin being additional to the main strength. A deep I-section centre keelson is continuous from the bow to the rear step. The side keelsons are of I-section and the intercostal stiffeners of Z-section. The bottom planing surface is longitudinally plated with flat sheets, the top and side sheeting also being plated longitudinally, but with corrugated sheets, "Alclad" being used for all plating. Five watertight bulkheads are arranged so that the aircraft will remain afloat with any one compartment flooded. Abaft the rear step the construction is somewhat different from that before it. Eight continuous box-section members run fore and aft inside the skin, the frames being intersected by these members Light intercostal stringers support the skin plating between the frames. Tie-rods and chains are used for the controls except in the wing, where flexible cables are used for the ailerons. The tail-trimming gear is operated by a hand wheel from the pilot's cockpit. The dual flying controls are constructed as a separate and complete unit which is not normally carried in the machine. 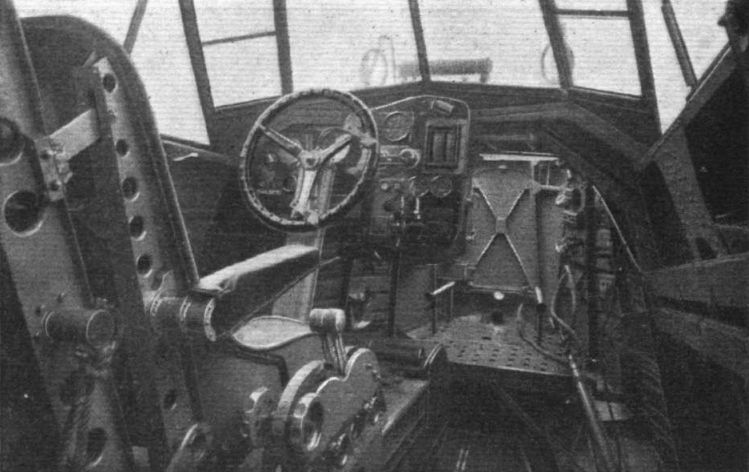 A three-axes automatic control is installed, with the units housed under the pilot's seat, the drive being an air compressor mounted on the top of the hull behind the transparent hood which is built over the pilot's cockpit. The armament consists of three Lewis guns fitted at the bow, mid, and tail cockpits. Wind shields are provided for both the mid and tail cockpits. The bomb load is two 500 lb. or four 240 lb. bombs, four light series bombs and four reconnaissance flares. Provision is also made for transporting one 18 in. torpedo under the starboard wing root against the hull side. Knuckleduster 1934. This flying-boat had gull-shaped wings and two steam-cooled engines. The Short S.18 "Knuckleduster" contributed much to the design of the Empire and Sunderland flying boats. Short R.24/31 (two Rolls-Royce "Goshawk"). THE SHORT R.24/31: Raising of the wings by giving a large dihedral angle to the wing roots, and the disappearance of the bulging chine are features of this machine. The engines are Rolls-Royce experimental. UNORTHODOX: This view of the new Short monoplane flying boat (two Rolls-Royce engines) indicate the departure from normal external design. ON THE SLIPWAY: This view of the Short R.24/31 gives a good idea of the lines of the hull. TAKING THE WATER: Two views of the Short R.24/31 going down the slipway at Rochester, and afloat on the Medway.